Dr Jane Mullett is the City Engagement Technical Leader at the UN Global Compact – Cities Programme. She is also an academic, with expertise in climate change adaptation, participation and community engagement and the arts. Jane was previously employed as a Research Fellow within the Climate Change Adaptation Program, RMIT Global Cities Institute (2008 – 2016), where her research focused on adapting critical infrastructure to the changing climate and understanding the role that climate change plays in all facets of an urban environment. In this role she worked across organisations in the Pacific, Asia and Australia bringing relevant climate science to risk management processes within a range of organisations. She also worked on the communication of climate risks and adaptation options at the community level, conducting participatory theatre workshops on these topics with those often excluded from decision-making processes. 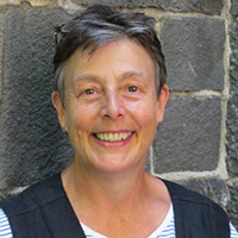 Jane has a background in the arts, as well as social science, and in this area has been involved in cultural programs that include the establishment of an Indigenous arts grant program for the City of Melbourne (1998 – 2002) and project manager for the establishment of the National Institute of Circus Arts in Australia (1995 – 1998). She has actively participated in community theatre and circus as both a professional performer and as part of community capacity building projects. As the City Engagement Technical Leader , Jane assists core city members to advance the Ten UN Principles and Sustainability Development Goals. This is through developing an understanding of the city’s priorities and challenges; seeking opportunities to promote the city’s achievements and sustainability practices, and connecting cities to other services and expertise. She also provides to advice cities on the mandatory bi-annual report to the UN Global Compact – the Communication on Engagement.